You are here:HomeFoot care Do Running Shoes Cause Injuries? Author austinPosted on February 14, 2019 April 14, 2019 No comment Do Running Shoes Cause Injuries? Let’s say that you have been away from running for years but suspect that your feet will need extra pampering now that you’ve decided to make a return to fitness. So you head over to Footlocker or a specialty running store and purchase a $120 pair of high-tech running shoes constructed with space-age materials, super-soft cushioning, stiff wide soles, and rigid heel box. These plush-fitting shoes might feel like heaven inside the carpeted store, but once you’re pounding out miles on the road, trails or treadmill, the fancy footwear could be damaging your feet and legs– and possibly lead to Achilles tendinitis, shin splints, plantar fasciitis, or knee pain. In a widely publicized 1999 study, Dr. Steven Robbins, a biomechanics expert at the McGill University Centre for Studies in Aging at Montreal, discovered that expensive running shoes aren’t worth the money and may even increase your risk of injury. Dr. Robbins found that overly thick soles cause a loss of balance. “It’s a myth that thick soles offer the most protection,” he said. Subsequent studies by other researchers confirmed Robbins’ findings. Runners in thick-soled shoes were more than twice as likely to suffer injuries as runners in thin soles. Robbins even went on to suggest that athletic footwear should be classified as “safety hazards” rather than “protective devices.” His red-alert warning was certainly not the message footwear giants like Nike, New Balance, or Reebok wanted the public to hear. The inherent problem with many running shoes can be traced back to what the human foot was designed for: provide a flexible yet durable platform connecting your lower body to move along the ground. (Our arboreal relatives like orangutans and chimpanzees use their feet primarily for grasping and climbing.) For eons, man walked and ran barefoot. Even the Egyptian pharaohs went barefoot. Because the foot is not dainty or fragile, it doesn’t require a rigid box to protect it from the repetitive-motion impact. But when encased in a protective sheath like an excessively built-up running shoe, the muscles, tendons, and ligaments in the lower extremities begin to atrophy, leading to what one exercise researcher called “wimpy feet.” Instead of the foot and lower leg acting as shock absorbers, it’s the shoe doing the work– which in turn causes a weakening of foot muscles, nerves, and tendons. Artificially supporting the foot contributes to its structural deterioration. Yet people who go around barefoot, observed Robbins, don’t suffer from chronic foot, ankle, or knee problems. Optimally, you want to run on the ball or forefront of your foot, not the heel. But the thick soles used in today’s running shoes force you to land on your heels. 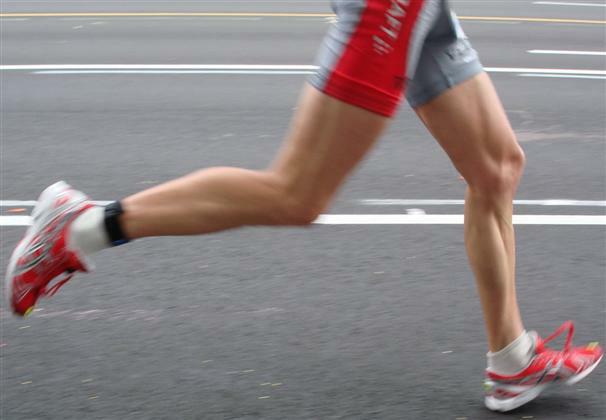 Running on the heel is unnatural and will cause biomechanical stress throughout your foot and leg. Try running barefoot, and no matter how slow or fast you go it’s nearly impossible to land on your heel. Yet we often hear that heel-to-toe striking is the proper way to run. Wrong. Chase your dog or kid around the home with your shoes off, and you will notice that your heels barely touch the ground. Footwear companies eventually began to address the paradox behind the sky-high frequency of running injuries and a large number of new high-tech shoe models that flood the stores each year. Nike, for example, introduced in 2004 a thin-soled shoe called the Free that partially mimics barefoot running. It performed more like a lightweight slipper or moccasin than a running shoe. Newton Shoes, of Boulder, Colorado has recently developed a revolutionary lightweight shoe with a thin sole and built-up midsection that provides a touchy-feely rapport with the ground. It’s virtually impossible to land on your heel first. Then there’s the truly bizarre-looking Vibram FiveFingers which one running magazine reviewer likened to “a kind of below-the-ankle nudism that simulates not wearing shoes.” The FiveFingers is made with a thin, abrasion-resistant stretch polyamide fabric, lightweight rubber Vibram sole, and here’s the real kicker: small, individual green rubber sleeves encase the toes. Each of your little piggies has their own home. The shoe literally fits like a glove for your foot. In response to the continuing glut of chronic running injuries, barefoot running is making significant headway around the globe, with numerous websites and blogs devoted to the subject Even Runner’s World suggested that runners might consider incorporating sessions of barefoot running into their training. “Running barefoot a couple of times per week can decrease your risk of injury and boost your ‘push-off’ power.” If you decide to go barefoot, start with small distances since your biomechanics are much different. Think of these short-training sessions as rehab or physical therapy that gradually strengthens under-utilized tendons, ligaments, joints, and muscles in your feet and lower legs. After awhile. you should discover additional barefoot benefits for your entire body such as better balance and posture. So when footwear companies make bold, extravagant claims that their newest pricey shoe model contains “deluxe anti-pronation and rear foot cushioning devices and an orthotic-like footbed cradle,” you should ignore the marketing hype, and go buy a pair of cheap, thin-soled shoes. Both your wallet and feet will thank you. “The problem is, the fancy running shoes have allowed us to develop lazy feet,” Dr. Nicholas Romanov, a sports physiologist in Naples, Florida, told the New York Times in 2005. Romanov, an emigre from Russia, is best known for having created the “pose running method,” which retrains your body to run more efficiently by making you land on the forefoot in what he calls “controlled falling.” The forward-leaning, soft-landing action, coupled with a short stride and partially bent legs, allows gravity to propel you right along. Also known by some practitioners as “soft-running,” the Romanov approach, which first received a jolt of national publicity in a 2004 Runner’s World profile by Roy M. Wallack, has become increasingly popular among injury-averse, high-mileage triathletes. And what about me? Several years back, when I prematurely thought I was going to start running again, I bought an expensive pair of New Balance 801 all-terrain trail running shoes. Product literature for the 801 boasted “lightweight compression molded EVA midsole for cushioning and flexibility” and an “aggressive solid rubber lugged outsole’” that could easily pound nails into sheetrock if I happened to misplace the hammer. I wore them only once. My feet seemed to lack any connection or kinesthetic awareness with the ground. Was it a good thing that my feet could barely feel any of the roots, ruts, and rocks along the trail? Was this cushy desensitization helping or hurting me? I wore these New Balance trail shoes only once. When I started running regularly, I decided to go instead with a pair of $39 everyday flat-soled sneakers with hardly any cushioning support. And so far, I have no complaints. Next Post Next post: Why run or walk barefoot?